5– Across BackMeasure across the back, at the top from one arm to the other arm. 6 – Across ChestMeasure across the chest, at the top from one arm to the other arm. 7 – Across Shoulder Measure from one shoulder point to the other, extend the tape measure straight across your shoulder as shown in the image. 8 – Arm BicepAround bicep at the fullest part of the arm. Take a close measurement around the fattest part of your hand. 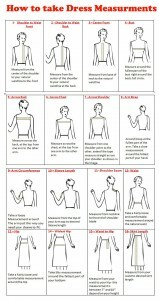 3 – Center Front Measure from base of neck to the natural waistline 4 – Bust Measure around the fullest part of the bust right around the back, full circle. 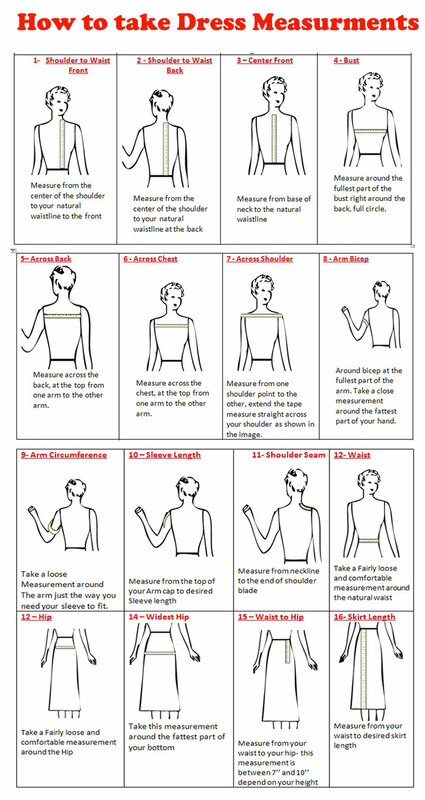 Please use the image diagram below to take measurements for your custom made skirts, enter this information in the custom fields when checking out.